Posted on 18, February 2016 by EuropaWire PR Editors | This entry was posted in Education, Germany, Management, Science, Technology and tagged Amir Naiberg, Belén Garijo, Merck, Prof. Mudi Sheves, Weizmann Institute of Science. Bookmark the permalink. 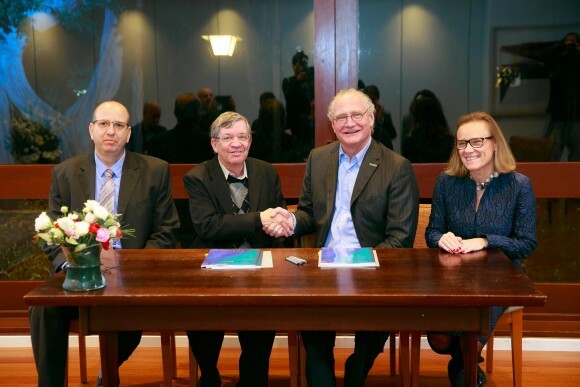 Darmstadt, Germany, and Rehovot, Israel, 18-Feb-2016 — /EuropaWire/ — Merck, a leading science and technology company, today extended the partnership with Weizmann Institute of Science, Rehovot, Israel, of by signing a new framework agreement, building on a successful innovation partnership of almost four decades. Merck’s ties in research and development collaboration with the Weizmann Institute go back as far as 1978. For example, Merck’s top selling drug Rebif® (2014 sales: € 1.8 billion) for the treatment of multiple sclerosis has intellectual roots in Israel’s prestigious Weizmann Institute, as has Merck’s oncology drug Erbitux® (2014 sales: € 0.9 billion). Merck employs more than 300 people, mainly scientists, in Israel, and has sites in Yavne, Herzliya, Rehovot and Jerusalem. The main focus of the activities in Israel is to manufacture biotechnology products for the life science market, research and development for the healthcare sector and materials development for display applications. More background information, including facts and a presentation about Merck’s engagement in Israel is available here. Merck is a leading science and technology company in healthcare, life science and performance materials. Around 50,000 employees work to further develop technologies that improve and enhance life – from biopharmaceutical therapies to treat cancer or multiple sclerosis, cutting-edge systems for scientific research and production, to liquid crystals for smartphones and LCD televisions. In 2014, Merck generated sales of € 11.3 billion in 66 countries. Founded in 1668, Merck is the world’s oldest pharmaceutical and chemical company. The founding family remains the majority owner of the publicly listed corporate group. Merck, Darmstadt, Germany holds the global rights to the Merck name and brand. The only exceptions are the United States and Canada, where the company operates as EMD Serono, MilliporeSigma and EMD Performance Materials.